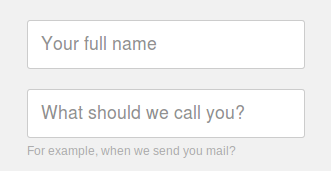 I signed up for the new online form service Typeform this weekend and noticed a very simple solution to a contentious problem. There you go, two simple questions that sort out what your “proper” legal name is and what you’d like to be called when machines talk to you. Names are really incredibly complicated pieces of information to collect due to the massive variety of conventions. Instead of this solution I have ended up in the past asking for first name and last name, given name and surname or even approving a hacky attempt to extract a name from an email based on the location of periods. The issue is that from a marketing perspective you want to personalise the interface and also try and make generic sales emails work better by using a person’s name. However in terms of sign up pages, ux often states that the longer the form the less likely people are to complete, which is an issue when your starting your business. Just like trying to stuff gender and honorific into dropdown lists names are really hard and if personalisation matters to you it is worth taking the risk to ask people how they would prefer to be named.